In the face of a growing U.S. aging population with significant spending power, beauty brands are increasingly trying to appeal to the over-50 demographic with innovative technology and products that claim to help with aging gracefully. At the same time, demand for natural ingredients is on the rise with consumers seeking recognizable, sustainably sourced ingredients that prove efficacious in their beauty routines. Fulfilling these demands is a tall order for brands and suppliers alike. That led BASF on its latest bioactive discovery. Our skin visibly changes as we age; from the emergence of large pores to the appearance of fine lines and wrinkles. These changes become visible because each layer of our skin changes structurally resulting in loss of skin elasticity and firmness. BASF discovered that there is a unique collagen that is found in every layer of our skin: collagen XVIII. Collagen XVIII is a collagenous proteoglycan with biological activity present in all skin layers which can impact the appearance of skin homogeneity, wrinkles, elasticity and tonicity. Another discovery was made—as we age, the gene and protein expression of collagen XVIII in skin decreases as well. Collalift®18, an ECOCERT and COSMOS approved raw material, was found to simulate the synthesis of collagen XVIII in the keratinocytes which are found in the upper layer of our skin, as well as adipocytes, which are found deeper in the skin. It counteracts the loss of tissue structure and cohesion seen during the aging of epidermis, dermis and hypodermis layers of the skin. In in vivo clinicals trials, Collalift®18 significantly reduced the appearance of pores. Within eight weeks of treatment, the appearance of crow’s feet decreased significantly while skin elasticity improved on par. inflammation and skin diseases. The extract is obtained using a proprietary process, then concentrated and standardized to key polyphenols. 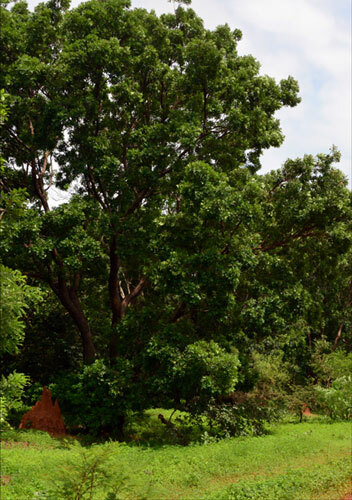 BASF has focused on the responsible harvest of the African mahogany bark, which is sustainably sourced from urbanization projects in Burkina Faso. The bark covers the surface of the mahogany tree like a natural sheath which attributes to the unique density of the wood. Akin to that, Collalift®18 helps support skin structural elements like a natural sheath, which attributes to the unique density of the skin. It is the ultimate skin matrix lifter promoting skin beauty, tonic virtues and resistance to ageing.